Epocha – Tasty & Wholesome Food! Epocha which means ‘a new or distinctive era’ in a variety of European languages is a newly opened restaurant in Rathdowne Street, Carlton. It is located in the stunning heritage listed Victorian terrace which overlooks Carlton Gardens. And as owner Angie Giannakodakis, researched and discovered that it was commissioned by gentlewoman Hannah Mabel in 1884 – and the upstairs bar pays homage to her and is aptly called Hannah’s Bar. Epocha is European inspired restaurant and bar brought to you by Angie Giannakodakis (former front-of-house manager The Press Club) together with business partner Guy Holder. The head chef is Mick Bolam who is the former head chef of Restaurant Sanctuary at Peppers in the Hunter Valley. The main focus of Epocha is around its main philosophy – sharing tasty and wholesome food. It is home style food that pays tribute to its European traditions with touches of Greek, English and French influences (such as the charcuterie and cheeses). As you walk up the stairs to the terrace house entrance you know that you are about to expect something that you will be awe of – and you wont be disappointed. A elegant and rustic dining room welcomes you complete with wooden floors (that are creaky for authenticity), low hanging lights, dark wooden furniture with a colourful tiled table top, a huge old school style clock on the wall and homely olive green chairs. It really has a homely feel to it and you know you are in good hands as the service is impeccable, warm and welcoming – you just fit right in. In addition to the main downstairs dining area, there is an upstairs area / function room with a balcony – this is Hannah’s Bar. You can come here for casual drinks as well as play games of backgammon. We were seating in the downstairs dining area and the first thing that caught my idea was a wooden trolley which had a variety of cheeses as well as desserts on offer. What also caught my eye on the trolley was the wooden frame which housed honeycomb and honey. Such a great idea which once again makes it feel more homely. The menu is split into different sections such as snacks, small shares, large shares, accompaniments, dessert & cheese. There is also a sharing menu which is $68 per person where the Chef will pick what dishes your table gets. We decided to pick some dishes from each of the snacks, small shares, large shares and accompaniments. The waitress was helpful in letting us know if she thought we had ordered too many dishes, and assisted us in choosing our dishes as well. Whilst we waited for our food we were given warm bread which comes in a knotted cloth bag which is something different. The bread (rye and caraway seed) was freshly made, soft and delicious. I got an oyster to start off with – fresh and tasty. We also got Mushroom Aranchini and Jamon, Fior Di Latte Croquettes to start off with. The Mushroom Aranchini was crumbed and crunchy on the outside and the filling on the inside was perfectly seasoned, and the mushrooms were moist and tasty. My friends did enjoy the Jamon Croquettes as well, and they were on the large side so that was an added bonus. We also got the Spiced Chickpea and Bread Crisps. The spiced chickpea was quite tasty and had a great balance of tanginess and spice. I loved the addition of the bread crisps – I enjoyed the crunchiness against the chickpea dip. Some of the smaller share dishes that we selected were – Spring Asparagus with Slow Cooked Hens Egg, Tarragon and the Baby Carrots, Honey, Goat’s Curd, Sesame, Beetroot and Skate, Caper, Lemon, Parsley, Fava and lastly the Confit Duck Leg, Peas, Lettuce. The asparagus dish was a very different and interesting dish – the asparagus was simply sautéed and absorbed the flavours of the tarragon, the hens egg was perfectly cooked and once you cracked it open the yolk oozed out and served as an additional sauce for the asparagus. The flavour combination was a mash of flavours that worked. The Beetroot and Honey dish was my favourite dish and to this day I talk about it. I LOVED IT. The honey together with the goats curd was a great mix and was delicious – add in the sweetness and softness of the beetroot and carrots and you truly have a memorable dish. Highly recommended. Skate is a type of large marine fish and this dish came with capers, lemon and fava – which is a type of bean. The sauce was tangy and creamy all at the same time. The skate was cooked fantastically and was still moist and mild in flavour. You really did need the addition of the capers and the sauce to really make the dish and make them it did. Another really tasty dish. Once we had finished our snacks and smaller share dishes, it time for the larger shares. First up we got the Bird – which consisted of the breast, wing, thigh and leg. Crispy and crackly on the outside, moist and simply seasoned on the inside. This dish was served with a swig of rosemary. The whole fish that we got was Flounder – this came with Fruit Rub, Dill, Lemon and Salsa Verde. The dish comes out to the table as a whole fish and then we get to watch our waitress de-bone the entire fish for us. It’s a great process to watch as they seem to glide through the process – I could never do it with such ease. The fish is buttery and cooked amazingly, the salsa verde and fruit rub give it a mix of tangy and sweetness – you could add lemon if you needed an additional tang. We did order another larger dish but it was never brought out – and we were actually alright with that anyway as we were all so full and still had dessert to go. Dessert time meant that the trolley was wheeled over to us for us to decide – they all cost $12. We settled on getting one of each dessert – Crème brulee, Chocolate Gateau, Tiramasu and Lemon & Ricotta Cannoli. The Crème brulee was smooth, sweet and small with a delicious crackling on top. The Lemon & Ricotta Cannoli was crunchy and the pastry was delicious – the lemon filling was buttery, sharp and strong all at the same time. The tiramisu ( I couldn’t have this as it had lots of alcohol in it) was quite alcohol filled as my friends told me but delicious nonetheless. The Chocolate Gateau was a clear winner – from the brownie bass to the centre chocolate mousse filling and topped off with a ganache chocolate topping. It looked as rich as it sounds but was such a great way to finish a fantastic meal. Epocha is a fantastic place that everyone should definitely check it out – be it for a casual drink upstairs or if its a meal at the dining room downstairs. The atmosphere is homely, welcoming and quaint and the service is one of the best that I have experienced in Melbourne. There is antique silverware, vintage cutlery and crockery, colorful table tops, wooden creaky floors all which add to its uniqueness. There is also an international wine selection and the staff are happy to assist in getting you the right selection. If there is one place that should be on your list of places to try out it should be EPOCHA. Service: Fantastic and Attentive and Friendly. We asked our waitress quite a bit of questions and she answered all of them and if she didn’t know the answer, she found out. They are also very inviting and hospitable. All round great service! * NOTE : The Lamb and Beef are Halal – at the time I went they couldn’t confirm that the chicken was as they couldn’t get in touch with the supplier. So just call up and check if you want to know. There was a long awaited catchup that was in order and I heard of George Calombaris’ new restaurant – Gazi – opening up so suggested we try it. Gazi is located where The Press Club used to reside – in Exhibition Street in the Melbourne CBD – and looks totally different to what The Press Club did. For all you Press Club fans – The Press Club will be re-opening in the later part of 2013 and located where The Little Press used to be situated (next door to Gazi). Gazi can be seen as the city sister restaurant of Hellenic Republic (located in Brunswick) and is an all day diner that represents Hellenic street food- Calombaris dubs this “Hellenic dirty food” – delivered in classic Melbourne style. Gazi is named after Calombaris; favourite Athens neighborhood and has a wow factor as you walk into the elegant cave like restaurant. The wow factor I talk about comes from the ceiling canopy of more than 3000 terracotta pots turned upside down that also provide a glow to the ceiling. Beneath this breathtaking art installation is where diners seat. There are booths along the outer edges of the restaurants, as well as seating at the bar which allows you to see the chefs moving fast paced to make each and everyone of the dishes. There is also seating throughout the rest of the restaurant in the form of wooden tables and comfortable seating. Another great aspect to the interior is the table decor – each table has royal blue plates with a huge evil eye located in the centre – which is called μάτι (mati) – and is a charm of sorts that according to superstition wards off bad luck. There is a description of this on the menu. Something a little special to be noted is the presence of two suitcases as decor – they are mounted on the wall facing the kitchen. They both hang open and if you take a look inside there is a date and name present – and these represent the years and the names of Calombaris’ grandfather and grandmother. The years represent the years which they made their long journey across from Greece to Australia. Such a great touch and addition to this already spectacular place. The staff are super friendly and welcoming – starting from the time you walk into the restaurant to when you leave. They welcome you with a Greek greeting such as “Kalispera” which means Good Evening. As I only eat halal meats, I asked our waitress if any of the meats were halal – she went to ask the chef if they were and came back to inform me that the Lamb and Beef were, but they weren’t sure if the Chicken was as they couldn’t get in touch with their supplier. The fact that they went to the effort to try and contact the supplier I thought was great. Thumbs up for service for sure. They are also enthusiastic and happy to offer up opinions on what types of foods we should try or if we had enough food ordered or not. This night there were four of us for dinner and we were located in a booth seating and as we had an early dinner booking, they needed the table back by 8:30pm. As we perused the menu’s we ordered some drinks. The drinks menu is quite impressive in itself – there are cocktails, mocktails, wine, ouzo and more to choose from. There are 6 different mocktails to choose from all of which have really interesting ingredients for a mocktail drink such as cucumber, beetroot, egg white etc. I started off with the Cucumber, Rose Water, Lime and Soda which was quite different. The Cucumber taste was quite strong and left quite a dry taste in your mouth. I also go to try the Pear, Ginger, Lemon, Egg White (sour) drink which I preferred to the previous one. The menu is split into 7 different sections – starting off with Dips, then Ethnika Vromika which are smaller dishes, Soulakakakia, Wood Fire Grill and Wood Fire Spit sections, Salads, Vegetables, Pulses & Grains and finally ending with Dessert. Head chef is Luke Croston and he has done great things in providing an insight into food from street vendors as well as bustling ouzerias. At Gazi the kitchen not only has a wood fire grill but a wood fired spit as well (you can check it out in the gallery above). There is a 10-course sharing menu that you can choose that costs $69 per person – and the kitchen can tailor make this to be vegetarian, pescatrarian etc – and is aptly named “Doing It Greek Style”. We did consider this option however with differing dietary requirements amongst us we decided to do our own version of the 10-course menu =p Also something to note is for Lunch on Monday to Fridays there is a “Bend Over Box” which takes you from savoury to sweet – something that I need to come back to try. We decided t o get 5 “Ethnika Vromika” dishes – which are the Hellenic Dirty Food hawker style dishes. The Crispy Lamb Brains with charred creamed leeks, picked grapes was first to arrive. I have never had lamb brains before so I was a bit apprehensive at first to try it out – but if you don’t keep thinking that they are lamb brains then it just tastes like a lamb cutlet really. There is a crunchy golden crumb on the outside and the lamb brain mixture on the inside is smooth and flavoursome – kind of creamy tasting. The addition of the creamy leeks and the pickled grapes which adds sweetness to the dish and it really is a great flavour combination. I actually really enjoyed this dish. Next we got the Prawns – Braised, Olives, Capers, Onions, Garlic & Parsley (there are three pieces of prawn in this dish). The prawns are decently sized and are wood-fired showcasing its woody flavours. The prawns are nice but not a stand out dish to me. We also ordered the Koulourakia with meze – Lamb Keftethes, Braised Baby Octopus. I was really looking forward to this dish – I am a huge Lamb Kefte fan – but I was disappointed at the size of the Keftethes. They are as small as a marble. The flavours of the Keftethes however are delicious – perfectly seasoned and cooked. This meze comes with Braised Baby Octopus, as well as some Smoked Pork Belly and some Bread to eat all these elements with. The concept of the meze is good idea and it works – I just think the Keftethes could have been bigger. We then got the Roast Bull Horn Peppers – Chargrilled Cuttlefish,Witlof. Garlic Dressing. This dish was quite colourful and vibrant, and had the flavours to match. The cuttlefish were cooked for just the right amount and wasn’t tough at all, the garlic dressing was punchy and together with the roast bull horn peppers (which provided the smokiness) worked well together. Lastly we got the Saganaki – Cumquat and Currant Mustard Glyko. The Saganaki – which in this case is a wedge of Kefalograviera – serves as the base and the cumquat glyko with currants is smeared over the top of it. This dish is an interesting concept putting together the sweet and cheese flavours and I think (as did everyone else on the table) that it worked. The cumquat jam provided some tanginess and the currants some extra sweetness to balance out the strong cheese flavour. We all had heard about the souvlakis’ here and couldn’t have come to Gazi for Dinner and not have tried them out. There are four different varieties to choose from – Chicken, Beef Brisket, Pork and Crab. I ordered the Crab Souvlaki. The Souvlaki is served on pillowy marshmallow soft flat bread which encases the soft shell crab that comes with coriander, mint and mayonnaise. There are juices which flood out the bottom, but you are still left with so much flavour as you bite into these. The other souvlaki have a welcome addition of French fries which I think is a great idea. I first had French fries in my souvlaki when I visited Saudia Arabia and it was strange at first – but a welcome strangeness. At this point we were all pretty full and wondered if we had ordered too much food. We still had the Baby Snapper from the Wood Fire Grill and the Chicken from the Wood Fire Spit to come. Together with this we ordered two Salads – Marouli – Iceberg Lettuce, Lemon, Olive Oil, Oregano and the Beetroot – Roasted, Pearl Barley, Peanut Hommus, Toursi Red Onion, Watercress. I couldn’t try the chicken from the wood fire spit – but my friends told me that it was a really great dish – the chicken was moist and the combination of the feta and the red capsicum (tyrokafteri) together with the white beans was tasty. The Baby Snapper from the Wood Fire Grill was great as well – the snapper was moist and not too dry. The fish on its own didn’t have as much flavour as I would have expected, but with the topping of chickpeas and caramelised onions it enhanced this flavour. The Beetroot salad was one of my favourite dishes of the night. The Pearl Barley together was soft and together with the crunchy sweetness of the beetroot and the nutty hommus – presented the perfect balance of flavours. The Marouli salad was a simple flavoured salad was a great palate cleanser from all the flavours we had had. Despite being quite full we couldn’t leave without trying out the desserts. And really everyone somehow has space for desserts. We placed our order and went with getting the Pavlova, Loukomathes, Brulee and Bombe Metaxa. It was 8:30pm at this point, and when I had made the booking was told that they would need the table back by that time. So we had to move over to the bar to have our desserts which we were totally fine with, but the waitress felt so bad and was apologising profusely (eventhough we knew we had to be out of there by a certain time) – see service is a sure winner here at Gazi. And for our troubles, she ended up not charging us for one of the desserts for being so nice about moving. The Pavlova is a dessert with the WOW factor – it is a spherical meringue that has been shaped around a balloon and dusted with dehydrated raspberry and musk. Inside this meringue cave is ruby red grapefruit sorbet and pomegranate seeds. There are so many little surprises in this dish and it’s really a fun dish to eat. The meringue is crunchy and not too sweet. I love the addition of pomegranate seeds adding a bit of tang amongst all the sweetness. Another WOW factor dish was the Bombe Metaxa which states is for two people but really it is so big that it could easily feed more. The dish come out and looks somewhat like a white bee hive (meringue) – once it has been placed on the table, it is flambed right in front of you. Inside is Tsoureki which is Greek Bread that is similar to Brioche, layered with chocolate ice cream and chocolate wafer. The meringue on the Bombe Metaxa is soft and gooey, whereas the meringue on the pavlova is crunchy and crisp. The Brulee comes with Date, Turkish Delight Crumble and was also delish. The brulee custard itself was smooth and creamy and full of flavour – the addition of dates and Turkish delight further added to this. Lastly we had the Loukomathes which are served with Cocoa Nibs and Honey. These are Greek donuts and are served warm and are like eating fluffy clouds. Really delicious. The atmosphere is buzzing and vibrant and the place is full of character. Everyone is there to have a good time at dinner and enjoy this bit of Greece right in the heart of the CBD and its so easy to do here at Gazi. It is welcome addition to the MADE establishment and to Colombaris’ repertoire. The service is fantastic and the food is really really delicious. I would definitely recommend this place to any of my friends. From the drinks to the desserts there isn’t much you can fault. And you really do need to visit to check out the terracotta pot art installation – so grab a group of friends and explore the menu. Menu – You can view the menu at http://gazirestaurant.com.au/menu/. Lunch menu for $27.50 which is called “Bend Over Box” which is available Monday to Friday till 3pm – it includes dishes from savory to sweet. Atmosphere / Ambience: Vibrant, Casual, Fun and Enjoyable. Bring a group of friends as most of the menu is for sharing dishes – this way you can sample the menu. Service: Fantastic – Friendly and very helpful if you want to know anything about the dishes or even if you want to find out if the meat is halal. Online Booking: Yes via website – http://gazirestaurant.com.au/ Bookings are recommended but if its not your thing you can just walk in. N and I headed into Kyneton for lunch on a cold and rainy Sunday for lunch. Kyneton is located about an hour from Melbourne and is a quaint little country town. It is known for being a country town with good food with many establishments being recognised in the Age Good Food Guide, as well as having many cafes that have been listed in the Cheap Eats Guide. Kyneton has many bluestone buildings that are the main feature of the town that date back to the Gold Rush era, where Kyneton was a major supply town for diggings. For lunch we were going to Annie Smithers Bistrot and I was thoroughly looking forward to it. Annie Smithers Bistrot is located in a historic bluestone building on Piper Street which now known as one of the most popular eating precincts in the state. Annie Smithers Bistro was recently bought by Tim Foster and his wife Michelle. Tim was the head chef at the Healesville Hotel in Yarra Valley. Annie Smithers herself will instead be focussing on her other restaurant – Du Fermier (located in Trentham, and a place I really want to try – it is next on my list! ), her gardens as well as putting out a second book. Annie Smithers instilled a farm to plate philosophy (which is also instilled at her Du Fermier restaurant) – which means that almost 90% of the produce supplied to the bistro is from the properties gardens and adjacent farmhouse. You can be sure that you are getting a fantastic meal with that type of philosophy. The venue itself is quite stunning – set in an old bluestone building with exposed brick on the inside coupled with high ceilings in both of its rooms and fitted out with modern wooden comfortable furniture. There are also beige leather cushion like seats along the walls. A huge arch shaped window in the main dining area allows lighting to stream in from the outside, further adding to the warmth and charm. We were given our menus once seated at our table. On this Sunday the restaurant was not quite at full-house and there were three wait staff. One small glitch for the whole day was that it took me twice to gesture to someone for them to come over to give us water and take our orders. This tainted our experience a tad bit, however from then onwards it was smooth sailing. We placed our orders (we got an entree and a main each – yep we were a bit hungry) and were given a choice between two house made breads – olive sourdough and normal sourdough. We both picked Olive Sourdough and it was delicious, fresh and warm! It also had the perfect crunch on the outside -yum! For entrees there was Grilled Par Boned Quail, Braised Organic French Style Lentils, Istra Chorizo, Cauliflower Fitter, Holy Goat Fromage Frais, Chervil and the Twice Baked Mushroom and Taleggio Souffle, Mizuna, Nashi Pear & Walnut Salad, Walnut Oil. The Mushroom Souffle was beautifully presented and looked like a little nest amongst the leaves – which was made out of salad. The Mushroom Souffle with Taleggio was scumptious – from the mushrooms to the cheese paired together with the sweetness of the Nashi Pear and the texture and nuttiness of the walnuts – it was all fantastic. I haven’t eaten anything like this before, and feedback from other patrons was to the same tune – they all loved this dish. N enjoyed his quail dish as well, and said the mix of the cauliflower fritter and lentils together brought together some great flavours and textures to the perfectly cooked tender quail. The cheese added a smooth texture together with a tangy yoghurt taste. Next up was mains – Ricotta & Herb Gnocchi, Australian Heirloom Pumpkin, Cavolo Nero, Truffled Pecorino, Crumbed Hen’s Egg, Herb & Fennel Salad and Brined and Grilled Loin, Baked Spartan Apple, Jerusalem Artichoke, Braised Cabbage, Fennel & Seeds, Cider Jus. With the mains you are given a side of vegetables which is the choice of the kitchen, we got Sauteed Brussels Sprouts with Butter and Salt. Can I just start off by saying I am not a fan of Brussels Sprouts, but these were delicious – the flavours were simple and easy but tasted fantastic! I might just become a Brussels Sprouts convert. Both the main dishes once again came out beautifully presented as expected. The Ricotta & Herb Gnocchi was freshly made and was soft and squishy, with a semi-hardness to it on the outside – just what you would want in a gnocchi. They were off-shaped but that’s what added to the homeliness of the dish and had the perfect amount of herb seasoning. The Crumbed Hen’s Egg was in the middle of the dish and was a crumbed and crunchy. This is something of what you would expect on a brunch menu, but together with the gnocchi and the veggies it worked. The egg was gooey and runny on the inside and when you mixed it with the a piece of gnocchi, pumpkin, some fennel and cavolo nero and some gratings of truffled pecorino it was a delicious mix for your tastebuds. It should also be noted that is quite a filling dish! Eventhough I was pretty full from the entrée and the main meals – of course I had to get something from the dessert menu (besides it was pouring with rain outside and it was cosy and warm at the bistro =p). I decided to get the Soft Centered Dark Chocolate Pudding, Honey Cream, Praline, Honeycomb & Hazelnut Ice Cream. The dish came out with the Chocolate Pudding, Ice Cream and Honey Cream in a glass to pour over the pudding. I knew from just looking at how good it would be! Before I could do anything I cut the Chocolate Pudding and let the warm chocolate ooze out, and ooze out it did! Perfect. The combination of the honey cream and the chocolate was delicious. Another highlight was the Honeycomb and Hazelnut Ice Cream. The Honeycomb was sugary, rich and crispy and together with the walnut and ice cream was so yum! Even N who doesn’t like sweet things much – ate most of the ice cream. You really do have to try it! Another little sweetener is that you are offered a selection of their home made petit fours. On this day we had a selection of a Rose Meringue, White Chocolate Fudge and an Almond Biscoti (we got to sample all of them =p). They were bite sized portions of sweet heaven! Annie Smithers Bistrot is a charming little place with some of the freshest and tastiest food I have had. The service is friendly and staff always have a smile on their face and will happily have a long conversation with you and answer any question. Annie Smithers is definitely worth the drive up to check the place out. The town itself is quite cute and you can definitely spend a whole day here. Atmosphere / Ambience: Cosy, Warm and Welcoming. Great for a day trip and for great food. Online Booking: No, only phone reservations are taken – NOTE: To avoid disappointment, try to allow at least 3-4 weeks in advance as weekend services book out well in advance. Hammer and Tong comes to you from the team of Dennis Ferriera and chef Simon Ward and is located in the previous location of The Brix. They pretty much left the fit-out as it was with the open kitchen, the large open windows and the decor. Both Ferriera and Ward come with a wealth of experience and have worked in restaurants such as Di Stasio, Caffe e Cucina to France Soir, Momo, Vue De Monde and Jacques Reymond. In Hammer and Tong they have brought together casual dining and fine dining all in one and they do it exceptionally well. Hammer and Tong has a bright and chirpy atmosphere and although it accompanies a smallish space, the light and large windows make it somewhat spacious. There are elements of old school from the big vintage scale at the front where newspapers are held one with a old school iron. There are three different dining spaces such as the main dining hall as you enter, where you can see the baristas’ busily making coffees, followed by the corridor bar and the sunroom at the very back of the space. Both the corridor bar and the sunroom has bar seating that overlooks the window as well as low table seating. In the corridor bar there are hanging plants over head and interesting lighting around the place. We placed our food orders and it wasn’t until we had almost received our food that we got our coffees. It was full house and I did have to remind them about our coffee orders – this was somewhat of a let down.The coffee was good though – creamy and smooth and is from Dukes Coffee Roasters. My Spiced Corn Fritters, Avocado, Sour Cream, Chilli Jam, Tomato with a Poached Egg came out and was plated up brilliantly. There were three corn fritters, atop of the tomato in a triangle shape with the poached egg in the middle and the other elements around. The fritters were dense and tasty and I loved the hint of spice attached to them. They were the perfect crisp on the outside as well. Combining them with the avocado, sour cream and chilli jam completed the dish perfectly. This was a sublime dish – one of the best corn fritters I have had to date. N ordered Fried Eggs with a side of Chorizo and said the Chorizo was the best that he has had at any of the many cafe’s we have been to. Hammer and Tong is great new breakfast/brunch place that has a great ambiance and fantastic music playing over the speakers. From the lines at the door it certainly is popular and after having tried it I can tell why – the food is fresh, delicious and unique, and you can tell the experience of the team from the dishes. I forgot about the fact that our coffees were late as those corn fritters were just amazing, not to mention the pancakes. Hammer & Tong offers coffee, breakfast, lunch, snacks and beverages six days a week, from Tuesday through to Sunday. Dinner is offered Thursday through to Saturday. Atmosphere / Ambience: Bright, Light and Chirpy – it really does pick up your day! * NOTE THE GOAT, BEEF and LAMB are all Halal Certified. It was birthday dinner time and I picked B’Stilla to try out. B’Stilla is a newly opened Moroccan restaurant tucked away behind Chapel Street in South Yarra. When I was making the booking I enquired if the meat was halal and co-owner Leon Kennedy was fantastic in responding and letting me know that the beef, goat and chicken are all Halal Accredited. Great service already! B’Stilla is a modern and spacious restaurant with an open kitchen and an outside seating area in the form of a long terrace which has overhead industrial heaters and plastic screens to keep the cold out. It is named after Morocco’s most famous pastry dish – the sweet-savoury B’stilla. This is the latest project from Jason Jones who co-founded Mamasita and remains a co-owner, and Leon Kennedy (Padre, Proud Mary). Both took a trip to Morocco and fell in love with the cuisine and enrolled in cooking courses to learn more, and then forged ahead with this venture. The aim is to deliver authentic and approachable Moroccan food, celebrating essential balance of flavours and fresh local produce and it safe to say that B’Stilla ticks all of these boxes. There is a real Moroccan feel to the place with its lattice of the 8 point star that is reminiscent with any Moroccan theme. This continues in ochre colours under the bar in the form of tessellated tiles. The open kitchen is lined with tagines and colourful preserved fruits and overlooks into a red painted dining area. This is where we were seated on this Friday night. There are simple wooden tables and chairs to further enhance the casual yet classy feel. The menu is designed to share and is split up into smaller entrée size dishes, followed by larger dishes which consist of three different tagines and dishes like lamb shoulder and beef ribs. There there are seven different salads to choose from and of course dessert to finish off the meal. There are Banquet options available as well (refer to the Menu section below for options and pricing). There are plenty of vegetarian dishes available as well which makes the menu robust to all. In addition to this, if you flip the menu over there is a handy glossary on the back that run you through some of the elements mentioned in the dishes. I think this is a great idea – saves the customer from whipping out their smart phone and googling what each thing is or asking the wait staff. After perusing the menu for a while we settled on a couple of the smaller dishes, two of the larger dishes with a salad – leaving room for dessert. I also ordered a mocktail – which had pineapple, passionfruit and mint flavours which was quite tasty as well. They ask you what flavours you want and make one up to suit that. Whilst we were waiting for our meals, we were brought out complimentary tea for each of us together with a small piece of date shortbread. This was a nice touch I thought and typically Moroccan. The mint tea was full of flavour and was a great way to start a meal. The first dish we got was the Lamb Ribs, Apricot and Cardamom. This was a super tasty dish – the lamb was cooked delicately and just fell off the bone – the apricot sauce added a sweetness to this dish. Having sweet flavours mixed with lamb was a great combination. Next of the entrée dishes was the Chargrilled Whole Prawn, Pil Pil and the Rgahaif – we got the spinach, eggplant, almond and yoghurt option ( there is also an oxtail option). The Rgaghaif was one of my favourite dishes of the night – it reminded me of a samosa in a sense – it was pastry wrapped with spinach, eggplant, almond and yoghurt. The pasty was homemade and delicious – I could eat loads of the pastry all on its own. The mix of flavours with the mentioned ingredients was tasty and the spices added to it was a great hit, with the almond finishing the flavour palate. The prawn dish was good but not great – the prawns were grilled perfectly and the addition of the Pil Pil (which is made of garlic, chilli, lemon and parsley) added to the flavour of the prawn – there was just something lacking. The last of the dishes we got was the Medfouna – Beef Cheek, Cashews, Potato, Labne – this dish was yet another winner. It resembled what looked like a meat pie but tasted so much better! The filling was moist and flavoursome and each element worked perfectly together. After letting our entrees settle we were ready to take on the mains. We ordered the Cous Cous Marrakech with Seven Vegetables, Seven Spices, Smen (which is oregano infused butter that has been aged and fermented). We also ordered the Fish Kefta Tagine and the Lamb Shoulder with the side of the Cauliflower, Pine Nut Paste, Ras el Hanout and Herbs Salad. Both the Cous Cous and Fish came in tagine dishes and were filled to the brim – serving sizes here at B’Stilla are quite generous. The Cous Cous with Seven Vegetables was flavoursome and fresh – the cous cous was cooked to perfection as were the vegetables which were piled up high atop the cous cous. Some of the veggies included chickpeas, potato, sweet potato, cabbage and zucchini. The Fish Kefta Tagine comes with black cabbage, saffron and potato and was delicious. The fish kefta’s were green in colour which I thought was really interesting but do not let that fool you as the flavour was great. The juice I did find to be a bit runny and not as flavoursome – I think I would have preferred it to be a bit thicker in consistency. The Lamb Shoulder was another favourite dish of mine – it came with Ginger, Cumquats, Parsnip and Sumac. The lamb was once again cooked beautifully and was soft and tender and coupled with the parsnip puree was delicious. The cumquats added a tang to the dish as well. The side of cauliflower was also outstanding – the cauliflower being lightly charred and coupled with the pine nut paste and the ras el hanout and herbs was a great addition and complement to all the other dishes had. We were all so full from the entrees and the larger dishes, but decided to share some desserts amongst the five of us. We got the Persimmon, Mehalabeya, Amlou dessert and the Rosewater Flan with Dates and Walnut Nougatine. The winner and standout out of these two was definitely the Rosewater Flan. The flan was something between a crème caramel and a crème brulee and had the right amount of wobbliness. The dish was creamy and smooth and the addition of the crispy walnut nougatine added texture to the dish. The Mehalabeya dessert I thought were just different elements put together on a dish that didn’t really mesh together all that well for me – I would have liked to have had more of the Mehalabeya component. B’stilla also has a strong focus on coffee and serves French Press and Cold Drip – both of which are African varieties from Proud Mary Coffee. The staff are friendly and well informed about the menu, and always are energetic and have a smile on their face and are happy to help out at anytime. We were lucky enough to have Leon serving us, and he gave us a good background about the restaurant. B’Stilla is a great addition to South Yarra and the fact that it is embracing Morrocan cuisine is a big win. The food is delicious and encompasses great ingredients in imaginative and unique combinations and the presentation is fantastic as well. The focus on a shared dish menu I think is great and more restaurants should encourage this. For a taste of Moroccan in Melbourne definitely check this place out. Menu – Refer to http://bstilla.com/menu.pdf. There are also Banquet menus available – 5 dishes and sides (savoury only) at $45 pp or 8 dishes and sides (includes desserts) at $65 pp. For Lunch there is a 3 course lunch menu for $35 pp. A minimum of two people are required for the Banquet menus. Atmosphere / Ambience: Casual, Modern and Classy. It is a chilled out place and is reminiscent of being a piece of Morocco in Melbourne. Service: Fantastic, Super Friendly and Helpful. Staff always have a smile on their face and make you feel welcomed. 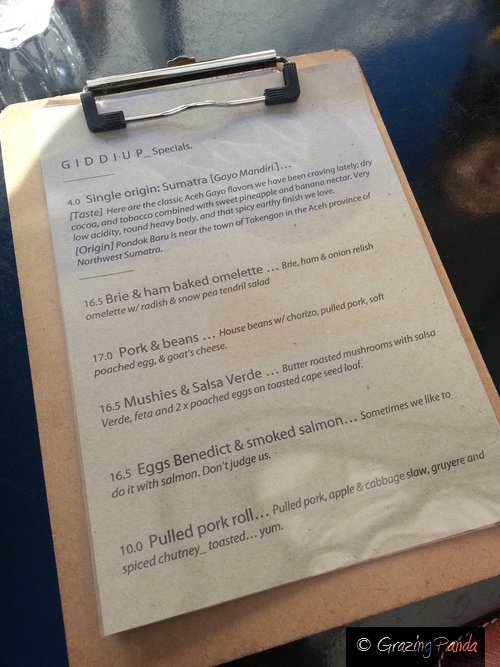 Giddiup is the latest venture from the crew behind Richmond’s Amsterdam Street cafe. It is located in hustle and bustle around South Melbourne Market, on Coventry Street. It located on the corner of Francis Street and takes up a rectangular space which has floor to ceiling windows. Inside the look is sleek, minimalistic and modern completed with black coffee bar and wooden benches. Further inside, there is the ingenious idea of tables made of two crates being piled on each other and a wooden top placed on it. There is seating available outside as well along Coventry street, where you can sit and enjoy the sunshine underneath the umbrellas and watch passers by. 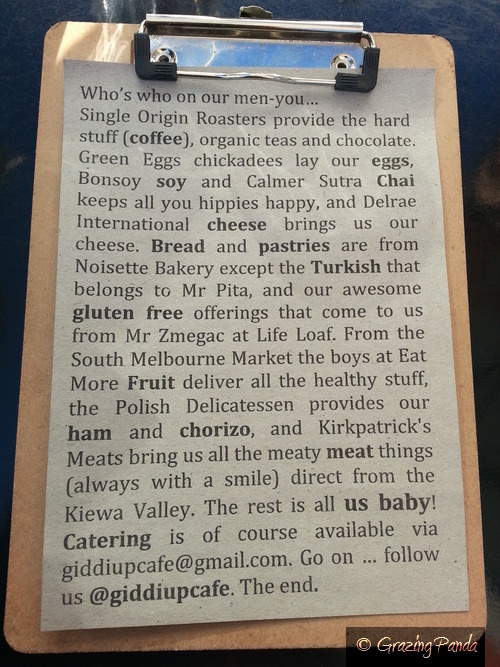 Giddiup offers a selection of ready-made sandwiches and pastries which can be bought at the counter, as well as having a sit down menu. There were four of us on this busy Saturday morning – it was around 11am and we had to wait about 5-10 mintues for a table. We were seated outside and whilst deciding on what we wanted to eat we ordered our coffees. The coffees did take some time to arrive and when they came out G actually ordered a flat white but got a latte instead. I ordered a latte as well and aside from that stuff up – the coffee was delicious and creamy and enjoyable. Coffee at Giddiup is from Single Origin Roasters in Sydney. I ordered from the Specials menu – there were 5 different specials to choose from – and got the Mushies & Salsa Verde. 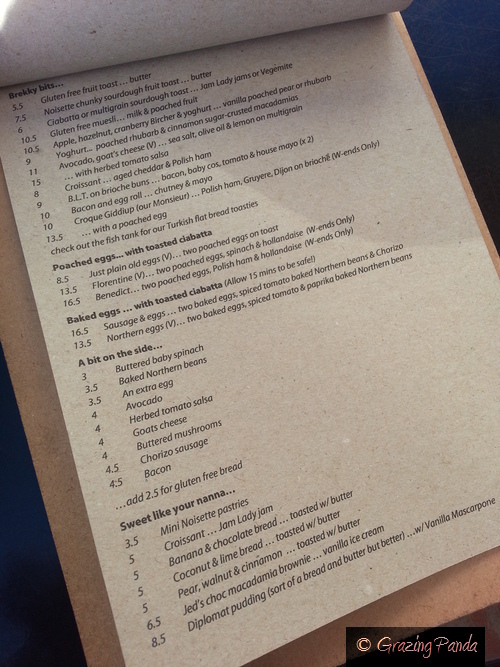 G got the Baked eggs – Sausage & eggs, B got the Croque Giddiup (Monsieur) and J got Fruit Toast. The dishes all came out together, however one of the waitresses wasn’t sure what dish she had in her hand and called the Croque Monsieur the Croqumebouche which was slightly confusing. All the dishes came out and were presented nicely. My dish had butter roasted mushrooms with salsa verde, feta and two poached eggs on toasted cape seed loaf.The eggs were poached perfectly and the mushrooms were fresh and flavoursome. I would have liked a bit more salsa verde on my dish but overall it was a super yummy dish. The others enjoyed their meals as well. The Baked Eggs I must say looked the best out of all the dishes we got. The chorizo looked vibrant and seemed to be cooked just right. G did enjoy them. As we were hanging around for a while longer, once I had topped up my parking I decided to have something sweet – I was tossing up between the Choc Macademia Brownie with Vanilla Ice Cream and the Diplomat Pudding (which is a sort of bread and butter pudding but better) with Vanilla Mascarpone. I settled on the Diplomat Pudding – it sounded good and I cant really go past mascarpone. Mascarpone is one of my favourite ingredients and if I see it as part of a dessert dish chances are I will order that. The pudding came out and had mixed berries amongst the soft and warm bread and butteryness and was absolutely delicious! Coupled with the vanilla bean mascarpone it was delicious and it really did complete the good foodie meal here at Giddiup. Giddiup is great small café, and has a relaxing and chilled out atmosphere to it. Their main emphasis is on sourcing local and fresh ingredients and at the front of the menu is a spiel on where all their ingredients come from. And additionally everything is made in house in the Giddup kitchen. Service is good and the staff are friendly. Giddiup takes simple meals and makes them delicious. Atmosphere / Ambience: Comfortable, Relaxed and Chilled out. Great for a weekend brunch. Banh Mi’s all freshly made! Shebeen is located in Manchester Lane in the Melbourne CBD, and has an interesting concept behind it. Shebeen is a bar that serves good honest, tasty and fresh food during lunchtimes, with 100% profits from every drink (beer or wine) all of which are sourced from developing nations – go back to a charity in that drink’s country of origin. This is the first of its kind in Australia. A Shebeen is usually four walls made of corrugated iron with someone’s mama inside brewing her own beer and were illegal during apartheid in South African cities – such as Zimbabwe and were designed to be shutdown hastily. This is where this not-for-profit bar gets it name from. Here in Melbourne, the fit out is of corrugated iron as well and you step inside to a lively and friendly environment that is reminiscent of a shack. There are mismatched tables and chairs covered in hoodies and jumpers, stools are covered in printed fabrics from Kenya and staff uniforms have been designed from Melbourne fashion house Alpha 60. The atmosphere is electric (even when I go at lunch time) – and is quirky, fun, different and colourful. Shebeen is the brainchild of co-founders Simon Griffiths and Zanna McCormish and was inspired by time the duo spent working in the developing world and realising the lack of funding. The South African roots continue with venue manager Sharon Custers. Its great to know beverage companies like Schweppes and Brown-Forman and interior architects Foolscap either donated products or gave their time and services for cost price or pro bono. All the food and cocktails on the menu are inspired by the 11 developing countries being supported through the initiative. Bar manager Sam Francis has tested several different recipes and all the ingredients are fresh and sauces and pickling of everything is done in house. The menu consists of Banh Mi’s – there are four different types to choose from including one vegetarian option, as well as sliders and cheeses. Since they are made fresh as you order them, you can tell them if you want certain things taken out or added to your Banh Mi’s. There is also hand-made ice cream which comprises of four very different flavours that you will not find anywhere else guaranteed. Flavours include – Thai chilli lime sorbet, cayenne cantaloupe sorbet – both of which are vegan option (yep they have thought about everything! ), choc coconut rocky road and Jesus juice (Pepsi and pinotagel). Doesn’t that just make you want to go try it out right away? The Banh Mi’s was fresh and authentic. I got the Vietnamese Lime Marinated Tofu with Crispy Noodles. The flavours worked well together and the sauce and chilli combined made for a great Banh Mi. I enjoyed the addition of the crispy noodles – I haven’t had that in a Banh Mi before. 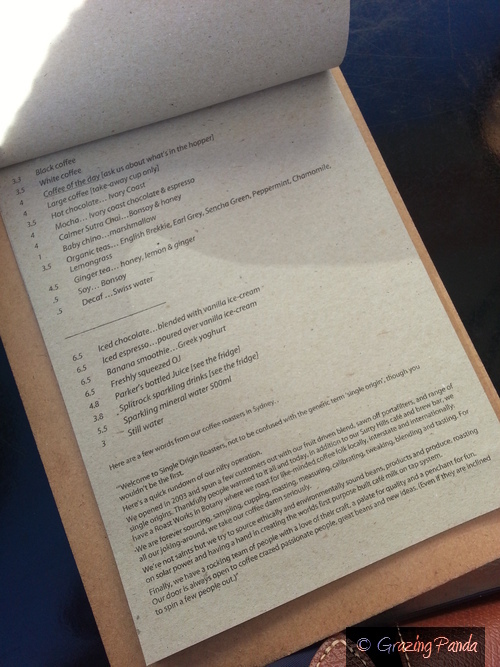 The menu is like a book, as it describes some of the charities that Shebeen has already helped out and I think this is a great way to tell the customer where the money is going and what exactly the money will improve and how. The drinks list is extensive and as said previously comes from varying countries. They also have a range of cocktails to choose from as well each with an interesting name such as First World Problems, Lychee Longtime and Earl Grey Tini to name a few. Coffee and Tea is also available – and is not what you would usually find at your everyday café. The Coffee is Ethiopian single origin or Vietnamese style, the Chai is handmade with Rooibos tea. I had their Chai and it was delicious and creamy – definitely one of the better chai’s I have tasted. The staff are knowledgeable and passionate about the charity organisations. There is also a cinema space and a band room and Shebeen hopes to be hosting parties soon enough, to keep with their lively and entertaining vibe. On most evenings there will be entertainment and live music. After years of being pop up stores, I am glad Shebeen has found a new permanent home to stay. The concept is great and what’s better than eating and drinking at a place where you know the money you spend is going to a great cause. A good time as well as feeling great! Awesome! From the Shebeen Website: We donate 100% of our profits, and your choice at the bar determines where they end up. Here’s how it works… Every beer, wine, cider and margarita sale sends funds back to that drink’s country of origin. We’ve made sure your money ends up in the right pockets by scouring the globe to find some of the smartest organisations tackling poverty in the developing world. So sit back and leave us to do the hard work while you feel good—even tomorrow morning. Atmosphere / Ambience: Fun, Entertaining and Lively atmosphere – great place to go for after work drinks. Service: Super friendly and enthusiastic! I have been wanting to try out NSHRY for a while and finally made it down on a Sunday morning. NSHRY – pronounced “Noshery” is located along the beach at Albert Park on Beaconsfield Parade. In keeping with their name – the theme of this place is to focus on a variety of Noshes that not only look great but taste great. They change and evolve their menu every few weeks. NSHRY is a classy glass box on the beach in a sense and has its very on outside area. The outside area is fantastic on beautiful summer’s day as it the best views of the beach. On this day the sun was out but the sea breeze together with the wind from time to time made it a bit chilly – we did still opt to sit outside though. It was around 11:30am and the place was packed with people who had ventured here after their morning run as well as young families and friends catching up. The inside is all about strong lines and modernity – with the ceiling being their major feature – consisting of wooden shards and reminiscent of stalactites. The coffee was delicious – it was smooth and rich and had a great creamy caramel flavour. NSHRY has a Synesso Espresso machine and there are other options of how you can have your coffee. You could try the single-origin coffee which is brewed with a Siphon or Cold-Drip as well. Our meals came out shortly after and the presentation of each of the dishes was really good, as you can see from the pictures above. Both the dishes had their version of a Japanese influence. My dish had poached crumbed eggs, which were crumbed nicely and the crumb was fresh, tasty and crunchy. Just what you want in a crumb! I haven’t had the combination of peas, spinach and asparagus before and eventhough sometimes there was a bit too much of a “green” overkill, the sauces made all the difference in putting these elements together. It was an interesting dish. N enjoyed his burger and the three different sauces the burger came with was fantastic. There was aioli, tomato and a spicy chilli sauce. N said the patty (which is handmade) was juicy & tasty and the bread was soft on the inside and crispy on the outside. The burger also came with Parmesan crisps, chips and coleslaw on the side. The Parmesan crisps is something you don’t usually see coming with a burger, but it was a great addition. NSHRY is a great place for a beachside brunch and would be fantastic during those lovely summery days – but having said that even in the cooler days it is just as good! The mesh of Japanese elements into a Western meal is done impeccably and the menu has variety. Put this place on your list to check out. Atmosphere / Ambience: Fun, Vibrant and has an amazing view of the beach. Great start to the day – you can hang out at the beach afterwards. Service: Fantastic, Attentive and Friendly. The staff always seem willing to help in any way they can. 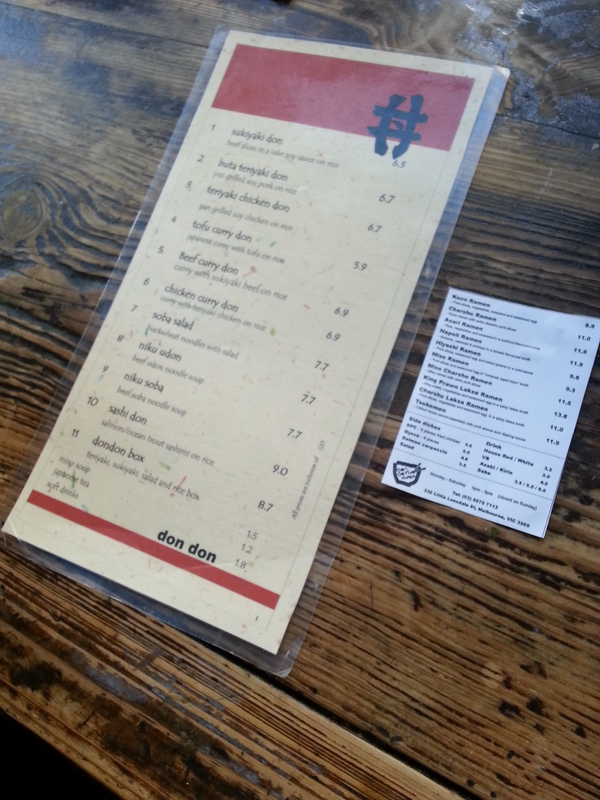 Don Too is a tiny Japanese cafe style place in the heart of the CBD in Melbourne and is a great option for work lunches. The dishes are quick, hearty and healthy and very reasonably priced. And when I mean quick it really is, my friends and I ordered the dishes and within 5 minutes they were at our tables! This is not to say the dishes were not tasty or fresh – because they were. Don Too has two sections to its restaurant and both areas – the front dining room and the back dining room — fills up pretty quickly. The vibe is energetic and vibrant. You are given menus and then need to order at the counter. The whole process is swift. The menu consists of a selection of bento boxes and curries. You can select from beef, chicken to tofu and salmon all ranging in the price from $6.30 to $8.70! You can refer to the menu link above to check out the menu in detail. At dinner time Don Too serves Ramen and serve 10 different types of ramen – the one I really want to come back and try is the King Prawn Laksa Ramen! The Ramen prices range from $9 to $14 (once again pretty cheap!). I ordered the Sashi Don – Salmon Ocean Trout Sashimi on Rice – and loved how the dish came out. The salmon came out and looked like a rose and was the centerpiece of the dish which was surrounded with all the other other elements – which included, salad, ginger, tofu and egg. The salmon was fresh as were the other ingredients. I would have liked a bit more sauce to my dish but other than that there were no complaints here. It also comes with a side of wasabi and soy. My friend got the Don Don Box which comes in a section split into different sections and includes Teriyaki, Sukiyaki, Salad and Rice, as well as a piece of fruit for dessert. You even get something sweet all for one low price. Please note that Don Too is a CASH ONLY place.